← Photography: Not my strong point. So, I found out last month that Geneon – formerly Pioneer – is getting out of the US anime market. I’m guessing that other companies will probably be licensing Geneon titles, and that their demise probably won’t affect my being able to see anything… but it was a little sad. 1) You could go to a comics convention and pay one of the many bootleg video sellers $20 for a VHS copy of something. If you were lucky, these were only one or two generations removed from the laserdisc source, but if you were unlucky you’d get a barely watchable mess. It’d be in raw japanese, of course, so good luck with the comprehension thing… and, of course, you were paying someone to make you an illegal copy of something. 2) You could, if you knew a guy who knew a guy, get a fan-subtitled copy of something. This was a process involving getting to know people, packing up video tapes in to a padded mailer – with another padded mailer and return postage included – and sending this whole bundle off. The guy you sent them to would generally copy what you asked for on to the video tapes and send them back… in a couple of weeks, or a couple of months, or sometimes not at all, but generally you’d get your tapes back. It did make for a very social fandom – you’d get to know someone and they would introduce you to a friend of theirs and your social network would get that much bigger, and most of this was done though honest-to-god paper mail because very few people had access to the internet. Eventually the social aspect faded and fansubbers started putting lists of anime on rec.arts.anime and saying “Just send me some money and I’ll put the stuff you want onto tapes that I buy and mail them to you” and then there were all kinds of flamefests about how much you should be charging per tape before you became a bootlegging profiteer yourself… it was ugly. 3) You could buy one of the very few domestic anime releases. Problem is, you were generally spending $34.95 on a VHS tape, so the picture was, well, VHS quality. Still better than the bootlegs or the fansubs, but a lot of money to drop on a videotape. Oh, and about half of them were released dub-only, so if you didn’t care for the voice acting talent of the day… and here’s where I carefully do not get in to anything judgmental. 4) You could import the laserdisc from Japan. Upside: A really good picture, great sound, and generally some bonus inserts in the laserdisc jacket. Downside: Of course there was no English translation of any kind and you were paying a bit of a premium for the quality. Like, mmm, $60 for a 30 minute episode. A single 30 minute episode. If you bought TV series, you could usually get 3 or 4 episodes for right around $100, or an entire series for six or seven hundred bucks. 5) Absolute best scenario: You could buy a domestically produced anime laserdisc. There were very very few of these, but they were usually cheaper than the Japanese LDs… without the cool bonus goodies that tended to come with Japanese LDs, and sometimes with some really ugly re-done artwork, but you got a pretty decent picture and sound and they were translated. You still had to deal with the “some are dub-only, some are sub-only” problem. Being an anime fan was kind of expensive and frustrating. This is the first release Pioneer did in the United States, the first Tenchi Muyo OVA. You got the episode on laserdisc, with both English and Japanese audio tracks. They didn’t even release VHS tapes of their series at first. They provided subtitles via closed-captioning. Granted, the first couple of releases had kind of wonky subtitles, but they got it straightened out by the third episode or so. You got the original Japanese LD sleeve – they provided a stick-on English back cover, but you could remove it and the original Japanese cover was underneath. They included the original Japanese inserts, and a second copy with translated text. They included a set of postcards. You got a free T-shirt with the first LD. They did this with their second release, Moldiver, as well. The whole thing was yours for the at-the-time insanely cheap price of $35. Most laserdisc stores tended to discount by 20%, so you could pick it up for $28. 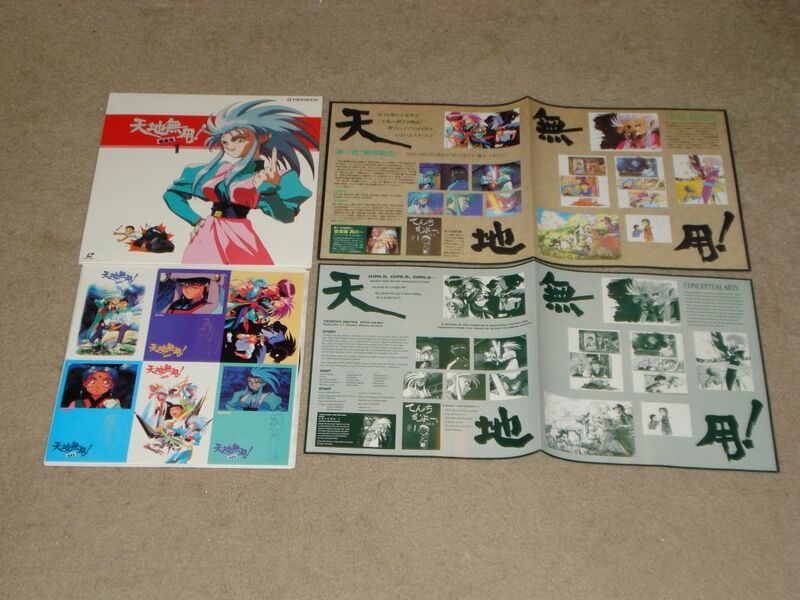 Now, spending $168 on the six laserdiscs that represented the first Tenchi OVA series is crazy by today’s standards – and, OK, it was crazy fifteen years ago, too – but at the time it was mindblowing. Here was an actual professional anime producer giving the fans pretty much everything they’d ever asked for, and releasing it for about half the price of the Japanese release. It woke up the other anime companies, too – the quality bar had been set so much higher than anything else on the market that they all had to improve their releases just so they wouldn’t look bad by comparison. It’s been a few years since I’ve really paid attention to what anime companies were doing what in the market. It hasn’t been an issue – everything comes out on DVD these days, with dual audio tracks and subtitles as a given, and anime DVDs are really cheap, especially if you have the mental stamina to hold out for the eventual multipack releases, so knowing what company puts out what release hasn’t really been on my radar. Still, having Geneon close up shop did make me a little nostalgic, and when I went around reading threads on the topic, most of them were focused on “what will happen to the series that they didn’t finish before they went under?” – there weren’t many “remember when?” discussions. So here’s to the passing of a company that went above and beyond for American fans back when there weren’t that many of us out there. This entry was posted in anime. Bookmark the permalink.